Normal keyboard based controllers are designed primarily as on-off switches with initial velocity detection. Once a note is triggered, its pitch is set and it’s left to do its own thing depending on how it was pre-programmed, and you as a player are typically no longer a part of the sound. Modern controllers have aftertouch, pitch-bend and a mod wheel, but those are add-ons rather than an organic part of how you play a note, and typically ignored by preset makers. Aside from either using a computer, iPad or MIDI controller of choice, you can also access some of the parameters using the on board menu. Parameters such as audio dim and gain, macro and rounding controls, pedal routing and output control and effect mix and timing are accessible with a little bit of menu diving. All in all, though you can control the macros and effect parameters using the built-in menu, ultimately from a performance perspective I do recommend pairing the Mini either with an iPad, computer or MIDI controller. If you’re just playing the off-the-shelf presets or your own presets though, you really don’t need anything else aside from the Mini. The synth engine is DSP based and has a massive number of synthesis engines including subtractive, fm, physical modeling and more. It’s an eight voice synth – though you can only input either one or two pitches at a time using the playing surface. You can feel the Mini additional notes using an external keyboard or sequencer. The Mini is extremely light – it weighs about 350 grams or 13 ounces – for comparison, that’s like less than the weight of two average cell phones. I conducted an unintentional table-height-onto-hard-floor drop test during the course of this review and the Mini came out unscathed and fully functional. There’s a little removable sticker on top with a basic description, and quite an extensive quick reference guide printed on the back. Despite being light, physically the Mini is built like a tank – the entire enclosure is rather thick aluminum – you play on a continuous nylon covered aluminum plate that sits on two piano wire springs and responds to very light touch, yet doesn’t play when you rest your fingers on it and has a nice broad range of motion. 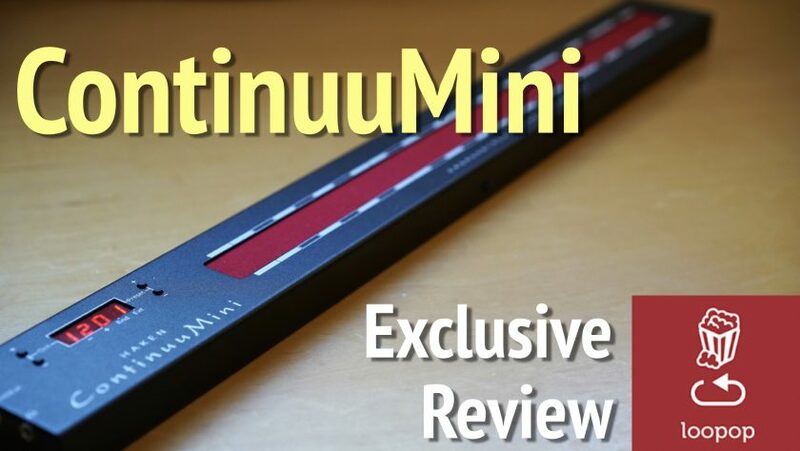 So, up until now, everything is fantastic – the ContinuuMini has the same sound engine as the bigger Continuum, it costs less, can be powered by a power brick, and is more portable and has better on board controls than the bigger Continuum. But, with that said, there are two big differences between the Mini and the bigger Continuums, other than 2 octaves instead of 4 or 8 on the bigger ones. The first difference is that the Mini’s control surface only supports either single touch or limited duotactic action. What does that mean? While the sound engine is 8 voice polyphonic, the surface itself can only detect full 3D motion on one note at a time, or two notes at a time, as long as they share the same Y and Z axis expression, meaning that the amount of pressure and roll is shared between the two notes. This can be viewed either as a limitation or a cool playing tool depending on what you’re trying to achieve creatively, but ultimately it’s much less than the fully independent multiple touch point support on the bigger Continuums. The playing surface of the bigger Continuum is also quite different – it’s made of neoprene and is soft, whereas the Mini’s hard aluminum playing plate is covered with red nylon around a much thinner layer of neoprene, and feels stiffer. That said, this difference in materials and feel has much less impact on play-ability compared to the others mentioned previously. You can also customize which MIDI CC’s are used for the Y and Z axis controls, and match the pitch bend to however your synth is configured – ideally you’d want this to be at 24 semitones so that you can slide across the entire two octave range of the Mini. Previous Post: MIDI to CV and back: Can your “regular” synth become semi-modular?